﻿﻿ In partnership with the V&A, we are holding a FREE symposium on 18 May here at the Arts University Bournemouth. 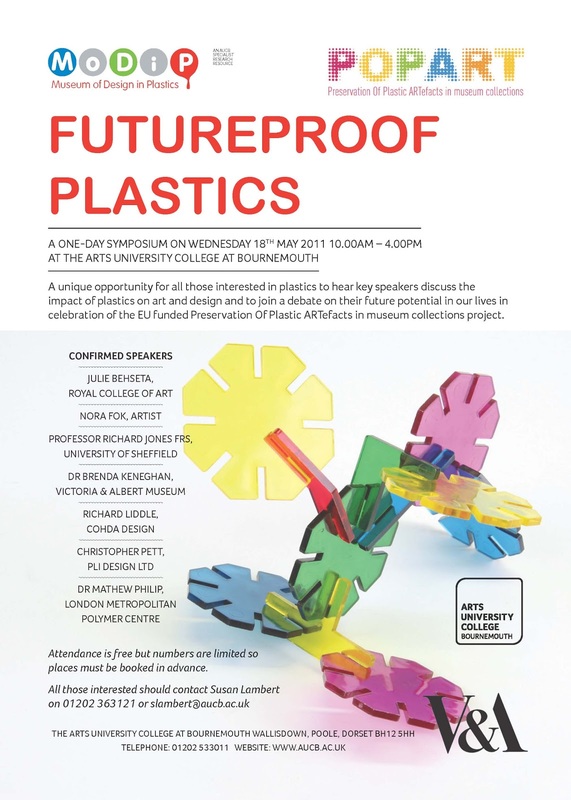 It is a unique opportunity for all those interested in plastics to hear key speakers discuss the impact of plastics on art and design and to join a debate on their future potential in our lives. A thread running through the papers and discussion will be eco design and sustainable use of plastics. The day is being held in celebration of the EU funded Preservation Of Plastic ARTefacts (POPART) in museum collections project. Julie Behetsa studied ‘Textiles for the Interior and Products’ at London Metropolitan University and is now a Research Student at the Royal College of Art. Her practice-led research focuses on post consumer and industrial waste, especially high density polyethylene, and results in the creation of recycled materials with new functions and new meanings. She will talk about her research under the title Attachment through the unattached. Nora Fok is an artist who has found inspiration in plastics. She works with nylon monofilaments to make intricate and complex wearable sculptures inspired by a variety of natural forms. Originally from Hong-Kong, she came to Britain to study ‘Wood, Metal, Ceramics and Plastics’ at Brighton Polytechnic. Her work is in a number of national collections including the Crafts Council, the National Museums of Scotland and the V&A. She will talk about her practice under the title Cloud Nylon. Professor Richard Jones FRS is the Pro-Vice Chancellor for Research and Innovation at the University of Sheffield. He is an experimental polymer physicist whose research interests include both polymer nanotechnology and the broader ethical and social implications of emerging technologies. He is the author of Soft Machines: Nanotechnology and Life, OUP, 2004, and will talk about how new nanotechnologies based on polymers can learn from biology, under the title Soft machines: exploiting mutability and randomness in polymer nanotechnology. Dr Brenda Keneghan is the Polymer Scientist at the V&A and represents the Royal Society of Chemistry on the European Association for Chemical and Molecular Sciences working group on Chemistry for Cultural Heritage. She edited the book Plastics, Looking at the Future and Learning from the Past, Archetype Books, 2008. She will talk about the POPART project under the title PopArt – the first EU-funded project addressing the problem of plastic objects in heritage collections. Richard Liddle was educated at Northumbria University and the Royal College of Art. He founded Cohda Design Ltd in 2007. Cohda has been described as a Punk Rock design company with a mission to research, design and develop innovative contemporary design products with a focus on sustainability. Cohda’s most famous design, the RD chair, is made from 100% recycled waste and has been highlighted as one of the most Iconic Eco designs of the last 20 years. He will talk about the potential of plastics to encourage innovation in design under the title Anarchy by Design. Christopher Pett, Managing Director of Pli Design Ltd, founded Pli in 2003. His aim has been to build a business with sustainable design and manufacturing principles at its heart from the beginning. The Reee chair, launched in 2008, is made from recycled Sony computer games consoles. Christopher will talk about the potential of such recycled plastic in mass-production along with its challenges under the title Single-source recycled plastic in product design and manufacturing. Dr Mathew Philip is Academic Leader in Polymer Technology at the London Metropolitan Polymer Centre. His research activities include multiple recycling of HDPE, PP, ABS and polymer blends; design and development of components from recycled polymers and composites; and sports product evaluation. He will provide an introduction to the issues of the day under the title An introduction to polymers and their impact on everyday life. The day will also provide an opportunity for you to see the MoDiP's exhibition You can do it with plastics which focuses on specific applications of plastics in order to demonstrate how the properties of plastics have influenced design and how the contribution of plastics is distinct from that of other materials. Attendance is free but numbers are limited so if you are interested please contact Susan Lambert on 01202 363121 or slambert@aucb.ac.uk.